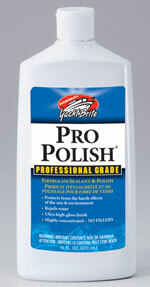 According to Shurhold, Pro Polish is scientifically formulated to protect fiberglass, gelcoat, clear coat and aluminum. It also serves as a cleaner, sealant and polish with UV inhibitors. Pro Polish repels water and provides a deep, glossy sheen, while protecting the surface from the harsh effects of the sun, saltwater and other environmental elements. Better than old-fashioned wax, this polish is polymer-based and contains no fillers or talc so when users buff out Shurhold’s Pro Polish, there won’t be a major mass of white powder. Producing virtually no waste, it enables owners to finish the job in less time and with less effort.